I hope you’ve been practising your serve, because you’re in for a gripping match with Centre Court. 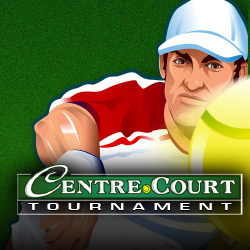 You’ll feel like a Wimbledon champion as you hit ‘Spin’, and dive into a game full of bonus challenges, fabulous graphics, and winning chances. Whether you love to watch the on-court exploits of Serena Williams and Roger Federer, enjoy a game yourself, or are simply a fan of well-made, bonus-rich slots games, this one’s for you. So, grab your tennis racket, and get ready to chase that golden trophy! Many of their games are optimised for no-download play, live play and also available on mobile platforms, and their software is multi-lingual, too. This game’s HD graphics give it a great look and feel. As you might expect, the reels are set against a lush green lawn – the perfect backdrop for a tennis-themed slots title. 5 reels and 3 rows combine to make a total of up to 9 win lines. As you give the reels a workout, you’ll see the symbols are all consistent with the theme, and include different tennis players in dynamic, mid-shot poses. Even the 10, J, K, Q and A symbols are enhanced with little tennis-themed touches (the Q, for example, is strung with mesh inside like a tennis racket), and it’s charming little details like this that make the game a treat for the eyes. WILDS –the Centre Court Trophy is a WILD symbol, and substitutes for any symbol apart from the SCATTER symbol. SCATTERS – 3 or more Tennis Ball SCATTER symbols trigger 18 Free Spins with random multiplier values up to 5x. During these Free Spins, Centre Court Trophy WILDS can create WILD symbol stacks, for the chance to accumulate large wins. Gamble –gamble your wins by choosing a card colour or suit. A correct colour doubles your win, and a correct suit quadruples it. There is a relaxing ambient soundtrack as you play, which enhances the game’s atmosphere, and classic arcade sound effects that punctuate spins and wins nicely. This game is rich in winning chances, too, with multipliers potentially leading to wins of up to 450,000 coins. Microgaming serves up a really gripping game with this sporty offering.The artwork and the bonus features give this game a really dynamic feel, just like a good round of tennis. This title wins game, set and match.